Blended to help keep you mobile and flexible and offering specific support for collagen formation. 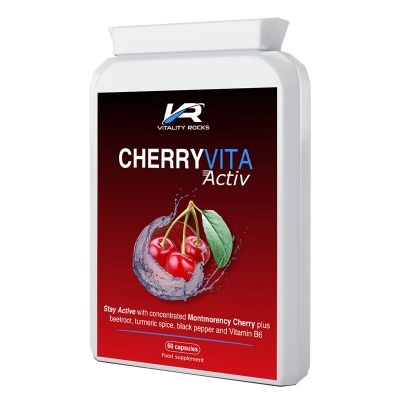 CherryVita Flexibility & Mobility capsules provide a lower dose extract of premium Montmorency Cherries combined Glucosamine HCL, MSM and Vitamin C, along with a proprietary blend of powerful nutritive allies. To complement our anti-inflammatory herbal blend, we have included Glucosamine HCL in bioavailable food form for maximum absorption and utilisation by the body. Glucosamine is an essential part of the building material for joints and the cellular 'glue' that holds the entire body together. Joint cartilage contains the highest concentration of glucosamine and many researchers now feel that glucosamine hydrochloride may be the best form because it has a slightly higher concentration in the molecule (83% versus 80% for glucosamine sulfate) and has better stability. The glucosamine HCL present in our CherryVita Flexibility and Mobility formula is also in bioavailable food form, for maximum absorption and utilisation by the body. MSM stands for methyl sulfonyl methane, which is a source of the essential mineral sulphur. Sulphur is involved in a multitude of key functions in the body, including pain control, regulation of inflammation, detoxification and tissue building. In many cases, joint pain is due to pressure changes in cells, which in turn affects the nerves that sense pain. If cells inflate as a result of excess build-up of fluid or a drop in the pressure surrounding them, the nerves register pain. MSM may support cell membrane fluidity. Montmorency cherries (also known as “sour cherries” or “tart cherries”), are considered to be a superfruit because they are packed with nutrients, including potent antioxidants and flavonoids. They have been used as a herbal remedy for centuries. For instance, the cherry (either as bark, root or fruit) has been used by Native Americans as natural pain relievers. Similarly, Rosehip is a fruit that is naturally high in the potent antioxidant, vitamin C. Antioxidant nutrients support lower levels of inflammation in the body. Nettle leaf is naturally high in chlorophyll (a powerful phyto-chemical), vitamin C (a potent antioxidant), serotonin, histamine, acetyl-choline and beneficial minerals including iron, calcium and silica. Both turmeric and ginger are herbs that act to naturally support lower levels of leukotrienes that cause pain and inflammation in the body. The bright yellow pigment of the spice turmeric also contains the active compound curcumin, while ginger is rich in antioxidants. Panax ginseng is the botanical cousin of Siberian ginseng. It is a rich source of phyto-oestrogen and the biologically active ingredients are called eleutherosides, supporting the recuperative power of the body. Apple cider vinegar: Experts suggest that joint pain and arthritis may be linked to toxins accumulating in the joints, since metabolic waste is often stored in connective tissues. At the same time, people with joint pain tend to avoid physical activity, which may result in an even higher toxic load. The pectin in apple cider vinegar may help to absorb toxins and move them out of the system, while the acids may support detoxification of the body. Bromelain is an enzyme derived from pineapple juice. It supports lower levels of inflammation in the body, by stimulating the production of plasmin (a compound in the body that breaks down fibrinogen - a substance involved in localised swelling). What's more, it does so without triggering the gastrointestinal distress so often associated with nonsteroidal anti-inflammatory drugs (NSAIDs). Bromelain is also growing in popularity among athletes who suffer frequent wear-and-tear injuries. Horsetail is a common herb that supports calcium absorption and utilisation and is rich in silica and mineral salts (including potassium, manganese, magnesium, sulphur and calcium) in support of bones and connective tissues. A deficiency in silica tends to precede the calcium loss that causes de-mineralisation of bones. Kelp may be useful where joint pain has resulted from toxin build-up in the body. It is a powerful detoxifier, infusing the body with alginates that bind with toxic chemicals and allow you to pass them safely through the digestive tract. Papain is a non-animal enzyme derived from the papaya fruit, which assists in the process of digestion. Arthritis Today, the consumer health magazine published by the Arthritis Foundation, states that papain is beneficial to those who suffer from either inflammatory or non-inflammatory types of arthritis. The inflammatory, or rheumatoid type, may benefit from papain supplements through an increase in the body's own analgesia, quick recovery from injury and a reduction in circulating cellular attacks that lead to a painful inflammatory state. Non-inflammatory, or osteoarthritis, can benefit from papain's ability to help remove the cellular waste products that build up in the joints. Vitamin C (in the form of ascorbic acid) has been added to this formula because it is a co-factor for collagen synthesis. 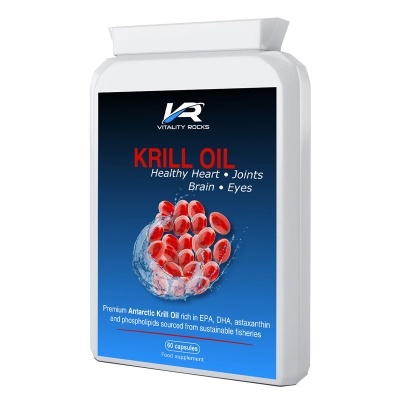 It contributes to normal collagen formation for the normal function of blood vessels, bones, cartilage, gums, skin and teeth. It also contributes to maintaining the normal function of the immune system, as well as normal energy-yielding metabolism, normal functioning of the nervous system, normal psychological function, protection of cells from oxidative stress, the reduction of tiredness and fatigue, the regeneration of the reduced form of vitamin E and increases iron absorption. 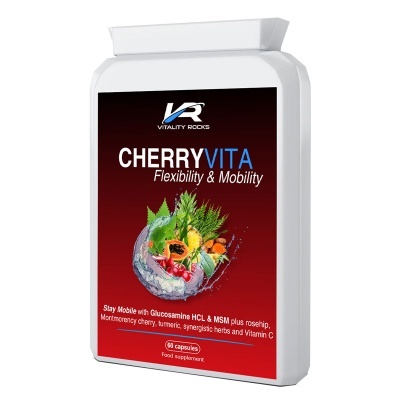 Vitality Rocks CherryVita Flexibility and Mobility supplement combines Glucosamine HCL, MSM and a proprietory blend of herbs and vitamins to keep your joints mobile, supple, flexible and pain free. 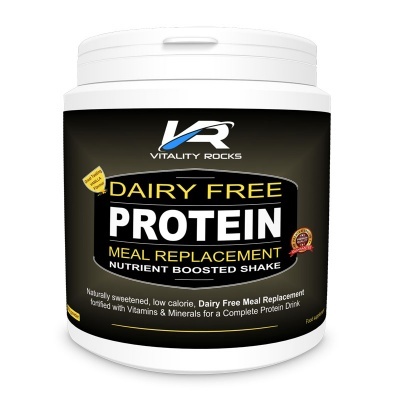 Glucosamine HCL Powder (shellfish), Methylsulphonyl Methane (MSM) Pdr, Capsule: Hydroxypropyl Methylcellulose (HPMC) (Vegetarian), Brown Rice Flour, Turmeric (95% curcumin), Anti-Caking Agent: Magnesium Stearate (Vegetable Source), Nettle Leaf 4:1 Ext, Montmorency Cherry Pdr, Ascorbic Acid (Vit C), Korean Panax Ginseng Pdr, Apple Cider Vinegar Pdr, Bromelain (1,200 GDU/g), Horsetail Herb Extract 10:1, 7% silica, Kelp Powder, Papain (2000u/mg), Rosehip 20:1 extract, Ginger Root 20:1 Ext.